So one thing that happens when I bring up the fact that Chicago, like pretty much all American cities, criminalizes dense development to the detriment of all sorts of people (I’m great at parties!) is that whoever I’m talking to expresses their incredulity by referencing the incredible numbers of high-rises built in and around downtown over the last decade or so. Then I try to explain that, while impressive, the development downtown is really pretty exceptional, and that 96% of the city or so doesn’t allow that stuff, or anything over 4 floors or so, even in neighborhoods where people are lining up to live, waving their money and bidding up housing prices. Then they make some non-committal grunt and change the subject. But I’m not BSing here. Not only does the city make it illegal in the vast, vast majority of the city to build super-dense towers or medium-dense midrises in very high-demand neighborhoods like Lincoln Park or Wicker Park, but it even criminalizes your standard two- or three-flat apartment building in the majority of neighborhoods, meaning that a developer who wants to build some moderate-price housing in a moderate-demand neighborhood (like, say, Portage Park) has to deal with local segregationists. Let me say that again: In most Chicago neighborhoods, it is illegal to build anything other than single family homes. Red = single family homes only. Yellow = non-residential use. What kind of public interest could this possibly be serving? PS – It is of course the case that developers sometimes get concessions from aldermen to rezone a plot of land they would like to build on. But when that happens, they’re susceptible to massive pushback from locals who would like to use the power of the government to segregate themselves from lower-income people, or to establish local housing supply ceilings for their benefit at great expense to everyone else. In any case, the proof is in the pudding: walk around any of the city’s desirable non-downtown neighborhoods and see how many developments that added net housing units have been built in the last 10 years. The answer is precious few. I was really excited to see your post headline (since I am a zoning geek and agree that much is to be desired with the CZO. However, your statement that only SFR is allowed is factually untrue. RS1 and RS2 are the only districts where this is true and they are rarely found in the city (as compared to RS3, RT, and RM). I’m obviously open to being corrected, but I don’t think that’s right. 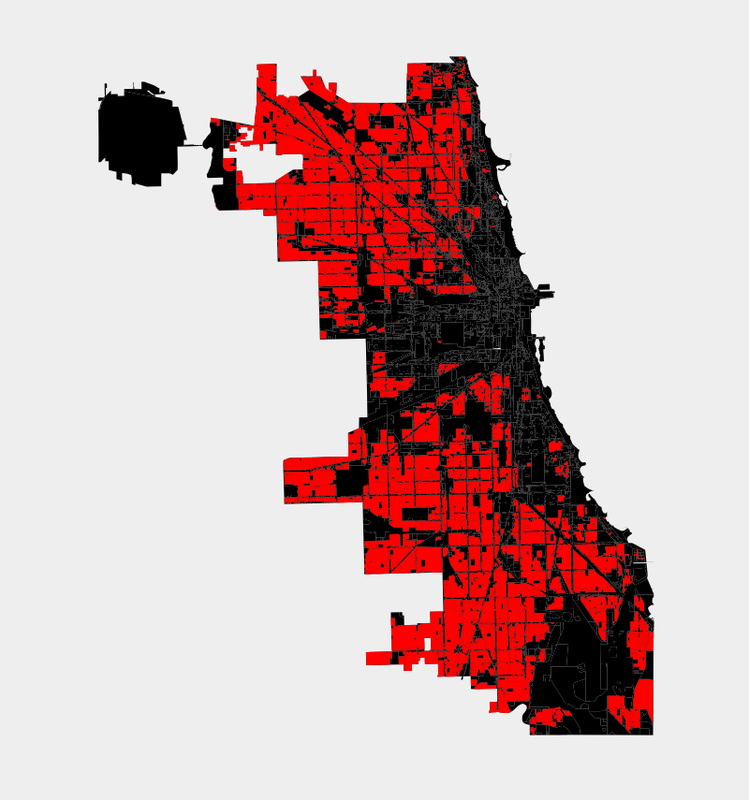 In RS-3 – which makes up the vast majority of the red areas in these maps – the zoning ordinance pretty clearly says you can only build two-flats if you a) have a double lot, which totally negates any increase in density, or b) if you have a city lot that is at least 20% larger than the standard size AND you’re building on a block face where at least 60% of the current structures are already multi-family housing. Given Chicago’s highly rigid street grid, there just aren’t very many extra-large lots lying around, especially in places that already have lots of apartments. And there aren’t even any exceptions – even tiny ones – for anything denser than a two-flat. Fascinating. I’ve often wondered why the northern part of the city is so conspicuously low-rise. Now I have the answer! Great post. Fascinating. I’ve often wondered why the northern part of the city, where apparently the wealthiest and the coolest live, is so conspicuously low-rise. Now I have part of my answer. Great post! Yep! This is basically the rule in every American city, including most of NYC outside of Manhattan. If you go to the North Shore suburbs, which constitute a huge area where hundreds of thousands of people live with average incomes in the $150,000 range, basically any non-American would wonder why there are no apartments or dense development in an area with excellent schools, nonexistent crime, and lots of good-paying jobs. The answer, of course, is that it’s illegal. Looks like the west side is wide open for multi-unit housing. Given that it is underpopulated, has plenty of vacant lots, and served by three rapid transit lines, perhaps the next few decades will see future growth (if any) channeled in this direction. Maybe. I think the very, very early signs of gentrification in the northern reaches of East Garfield Park are already apparent. But I suspect it’s going to be a while before we see intensive development there. The PMD areas that are purple on the zoning map should also be yellow on your second map. Some of them should, yeah. But some are residential projects. So, not wanting to go through each PMD and wanting to err on the side of caution, I left them out. But yes, the map I came up with actually overstates by a decent amount the area available for multi-unit buildings. Very interesting. As a planner in Houston, I’d love to be able to do this type of thing, but we don’t have zoning! Instead, we have deed restrictions, and it’d be nearly impossible, and time/cost prohibitive to figure out where solely SFR. We have some ordinances that limit development to single-family residential, as well as the size of the lot, limiting subdivisions for townhouses. This, however, is not a blanket ordinance, and is applied for by landowners within a block. Here, there is such a piecemeal building of multifamily and SFR townhouse development booming, where that housing can exist in some pretty weird places as long as it meets deed restrictions. Most planners understand the flexibility that this allows, and that flexibility has probably kept Houston’s rental costs fairly low. That’s interesting. I’ve been a bit puzzled by Houston’s land use regulation situation for a while. I need to make it down there sometime, but my girlfriend went to school in Dallas and so has a bit of a prejudice against it. A prejudice that I’m not likely to make much headway against by talking about how cool it would be to drive around and guess about zoning codes. Houston is definitely worth checking out. As an Austinite, and a fairly chauvinistic one for the first 10ish years of my time here, I have to say Houston is killing it these days. It pains me to say it, but almost everything we’re doing wrong, they’re either doing right or least better. Deed restrictions can be *evil*. It required a Supreme Court ruling to get rid of the “whites only” deed restrictions. The only good side of a deed restriction is that, by ancient law, you can’t just have a deed restriction: it has to be in the form of an easement which is owned by someone specific. So the way to rip the deed restrictions out is for a developer to “blockbust” by buying out all of the neighbors who hold the easements on the deed restriction. I would assume that there are Dallas developers doing exactly that. To me, hi rises in single family areas are more objectionable than simply implying that they should be able to be built everywhere. Including height limits in this piece would have been useful since the discussion of zoning districts without that one requirement isn’t as focused.